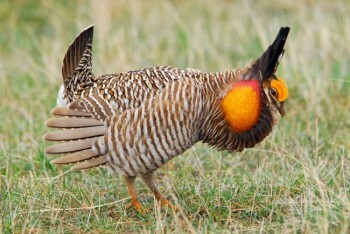 A male prairie chicken shows off on the Fort Pierre National Grasslands. Photo by Chad Coppess / South Dakota Tourism. Spring has sprung and love is in the air. Well, it's hormones really and now’s a great time to see the mating dance of the prairie chicken. 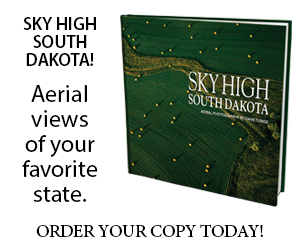 I asked outdoor photographer Les Voorhis and he said the best place to view them is Fort Pierre National Grasslands. “They have blinds you can reserve on prairie chicken leks and [Fort Pierre National Grasslands has] one of the highest population densities in the state,” Voorhis says. What is a lek, you say? Oh, it’s just the name for an assembly area where animals carry on their courtship behavior. The area looks no different than the rest of the prairie until the birds get together and start strutting around. Lek can also be used to describe the group of animals courting. During courtship, the males inflate air sacs on the sides of their necks. They also emit a very distinct call that you can hear in this video. Three blinds are available to use at no charge on the Grasslands’ leks. You can make reservations for viewing times in April and May. The 8-foot long, plywood structures hold up to four adults and have small square windows for viewing and photographing. Blinds aren’t insulated, so dress accordingly for crisp morning air. You’ll want to get to your viewing spot a half hour before sunrise. If you arrive late, the birds will see you, flush, and may not return that day. Call the Fort Pierre National Grasslands at 605-224-5517 to secure your spot. They’ll send a map so you know where you’re going. Ruben Mares, Wildlife Biologist with the Fort Pierre National Grasslands, recommends finding the blind the day before your viewing time. It can be hard to locate before the sun comes up. Mares says if all three blinds are full there are still several places people can view the birds from a distance. Just call the Grasslands office and they will recommend locations. I just heard from Ruben again about this. He says the season started a little early this year. The birds should be dancing strong for about another month, so reserve your spot soon.